A recent news article about the search in London for the remains of sailor, cartographer and explorer Matthew Flinders interested me on several levels. Firstly, the existential ones: what do we leave behind when we die? If buried, how long do those remains last? How can we identify someone from remnants of their body in a disturbed graveyard hundreds of years after death? Is it even possible? Obviously modern science has techniques that are helpful in identification, but there is nothing foolproof yet. The archaeologist quoted in the news item admitted that an intact coffin with a legible name-plate is the best bet for accuracy, but time and previous activity at the burial ground often prevent these from being present. I hope that they are successful in this venture, but it seems like a major undertaking. My next poser is one that I have articulated before on these pages, and that is: how brave were those explorers of yesteryear? They set off on unknown and therefore largely unplanned journeys of discovery not even sure of being able to return home. I suppose today's equivalent would be setting foot on the moon or the potential for space travel to other planets - a one-way journey in terms of today's science. Matthew Flinders (pictured below) was born in Lincolnshire on 16 March 1774 and died in July 1814, just 40 years old. But his accomplishments in those years are simply amazing. He joined the English Navy at the age of 15 and, in 1795 after early journeys with Captain William Bligh and others, found himself on a ship bound for Port Jackson that was carrying the next governor of New South Wales, Captain John Hunter. Flinders must have been a curious and adventurous seaman. He and ship's surgeon George Bass explored Botany Bay and then Lake Illawarra in a couple of small vessels named Tom Thumb I and Tom Thumb II. Then Flinders, by then a lieutenant, was tasked to discover whether Van Diemen's Land was separated by a strait from the mainland. In 1798 Flinders, commanding the Norfolk, discovered Bass Strait (named after his fellow-adventurer) and circumnavigated the island we now call Tasmania, thus charting a quicker way to reach Sydney from England. After this voyage Flinders continued northwards and in July 1799 he spent a couple of weeks sailing around Moreton Bay - he was the first English explorer to enter the area. Although landing at a few points and even leaving his ship to climb Mt Beerburrum, Flinders did not find the river that Captain Cook had surmised would be thereabouts - it was left to John Oxley to discover the Brisbane River in 1823. 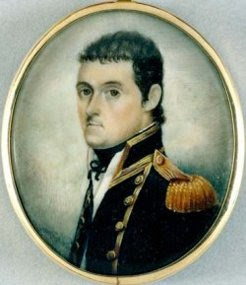 Flinders sailed home to England aboard Reliance in 1800, whilst there publishing his accounts of the discovery of Bass Strait, not to mention getting married to Ann Chappell in April 1801. 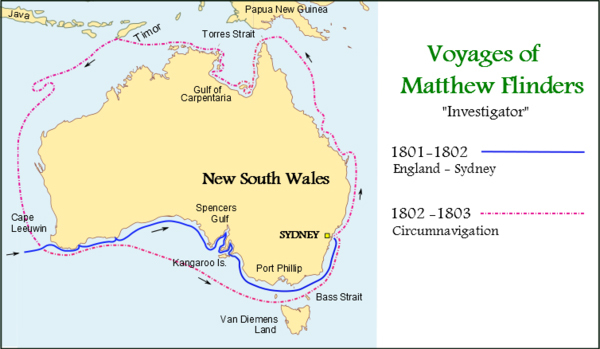 He was ordered to command Investigator back to Australia to further explore its coastline and Flinders was to set off this voyage in July 1801. Here there was some controversy, as Flinders had wanted to take his wife with him on Investigator, even though this was not allowed by Admiralty. When these plans were uncovered poor Flinders was specifically warned against taking his wife on the journey, thus causing the two to be separated for nine years. We now know that Flinders' major nautical achievement, the circumnavigation of Australia, took him from 6 December 1801 through to 9 June 1803, and was achieved despite a leaky ship that needed constant maintenance and repairs during the voyage and was actually deemed to be unseaworthy on its return to Sydney. Space does not allow me to present Flinders' subsequent adventures, but he was imprisoned by the French (who were at that time at war with England) on the isle of Mauritius from 17 December 1803 to 14 June 1810, then arrived back in England in October of that year when he was promoted to captain. Flinders wrote his superlative work "A Voyage to Terra Australis" that was published on 18 July 1824, the day before he died. The Australian Dictionary of Biography says of Flinders' final resting spot: "He was buried at St James's, Hampstead Road, but later alterations to the churchyard have obliterated his grave, so he was 'pursued by disaster after death as in life'." I very much doubt whether any identifiable remains of Matthew Flinders are likely to be unearthed in this huge project, but imagine the excitement if it happened. Its wonderful and great history of Brisbane city. Thanks for providing great information.